The past 36 months in insurance make an excellent case study for university classrooms. How did InsurTech startups first threaten the insurance industry, then inspire the insurance industry and now end up as mentors, students and partners with the insurance industry? (For an overview of the InsurTech timeline, see last week’s blog.) The study is particularly fascinating if we consider how technologically-savvy most insurers were to begin with. Given time, without an influx of outside InsurTech influence, incumbent insurers would undoubtedly have reached many of the same business and technology changes and advancements that were brought about by InsurTech outside thinking, development and investment. 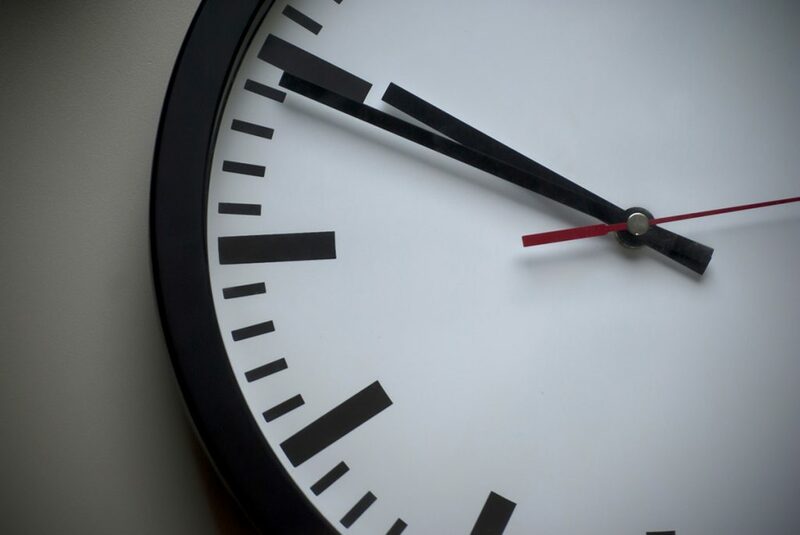 But new digital businesses, digital technologies and digitally-savvy customers created a time-warp — where digital dreams needed to become today’s realities … overnight. InsurTechs brought new thinking to the table by focusing on external customer pressure points through product innovation such as price, ease of access, engagement and new solutions for un- or under-served markets. Bit by bit, new cloud-enabled, mobile-ready, digital-first insurers and MGAs and new solutions emerged that challenged conventional business assumptions and the traditional “core” systems used. Now, insurers have done more than catch on — they are becoming InsurTech pioneers of their own, while at the same time partnering with the outside InsurTechs and ecosystems that will make their businesses digitally-ready. And in some cases, they are going much further by investing in and taking InsurTechs under their wings, providing them the resources, insurance expertise and space to test and grow up into the “real world” of insurance. As always, time was the issue. Incumbent insurers didn’t have the strategic focus or priority because they were encumbered by (or in the midst of replacing) their legacy system frameworks that were based on traditional business assumptions of the past decades for insurance. InsurTechs held no such assumptions, giving them a fresh, outside view of the possibilities. And insurance customers were increasingly impatient to receive the kinds of digital service they were receiving elsewhere from industries and companies that were rapidly changing expectations like Amazon, Apple, Netflix, and more. The result has been the growth of hybrid relationships that mix competitive efforts with partnerships, investments and ownerships. If this were a case study, what does the January 2019 InsurTech snapshot look like? To find out what InsurTechs are thinking, Majesco, in cooperation with the Global Insurance Accelerator (GIA) and the Silicon Valley Insurance Accelerator (SVIA) recently completed a survey and an accompanying report, InsurTech: Energizing the Shift to Digital Insurance 2.0. The survey was given to two different sets of InsurTech leaders — Insurer/Reinsurer/MGA startups and Outside Solution/Data Provider startups. For our purposes, we’ll call these Insurer/MGAs and Solution Providers. What has been their focus so far and how might that change? What are InsurTech views and what have they learned? What has been their focus? In Majesco’s survey, Insurer/MGAs had higher growth than Solution Providers over the past year. More importantly, they had higher growth — 10-15% more — than what incumbent insurers indicated in our 2018 Strategic Priorities report. Because focus is a broad concept, we broke down InsurTech priorities into Product Focus, Value Chain Focus and Important Technologies (which we’ll cover in Incumbent Insurers and InsurTech, Part 2). 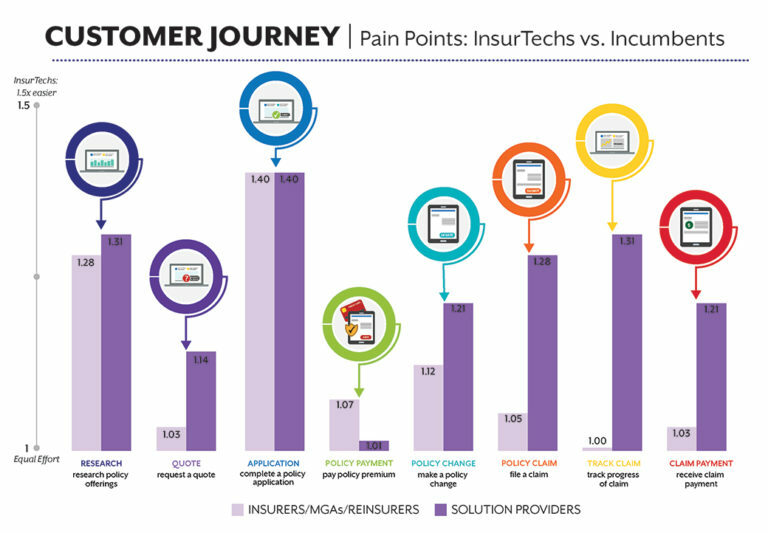 Both InsurTech segments are devoting most of their attention to P&C lines of business, with Solution Providers having more emphasis on commercial and specialty lines, and Insurer/MGAs on personal lines. P&C processes, particularly for personal and commercial lines, seem to be easier to transform, easier to integrate with InsurTech capabilities and quicker to realize financial gains or loss reductions. 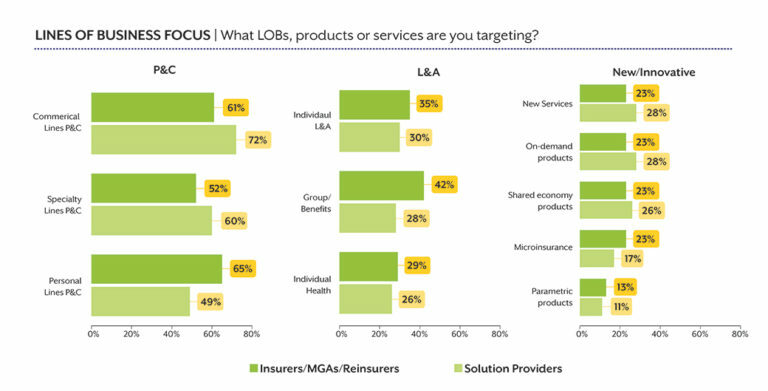 In contrast, Insurer/MGAs are ahead of Solution Providers in their focus on L&A lines of business, especially Group benefits and Individual L&A. The lack of focus here by Solution Providers could impact the L&A segment to quickly innovate and transform. However, as we noted in our previous blog, Incumbent Insurers are from Mars and InsurTech Startups are from Venus: Panel Discussion Part 1, some InsurTech insiders are seeing increasing interest and activity in the L&A space. 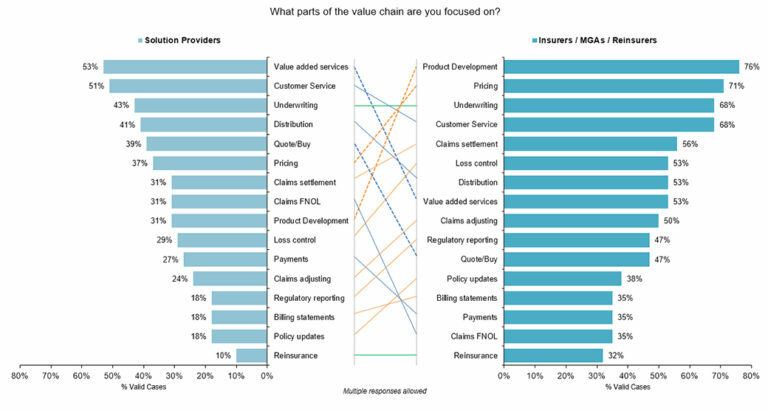 Insurer/MGAs have a higher level of focus than Solution Providers across all parts of the value chain. In contrast, Solution Providers tend to have specialized products or services for specific value chain areas. On a relative (i.e. ranking) basis, there are some interesting differences in priorities between the two segments. Figure 2 shows the disparity between priorities with connector lines. The slopes of the lines indicate the degree of differences in the ranks of each value chain component, and subsequently, the potential advantage or disadvantage of each. Solution Providers, for example, state their number one priority as Value Added Services. For Insurer/MGAs, this is 8th on the list. For the Quote/Buy portion of the value chain, Solution providers have prioritized this as 5th, versus an Insurer/MGA priority of 11. Insurer/MGAs place top priority on Product Development (#1 vs. #9 for Solution Providers) and Pricing (#2 vs. #6). Collectively, they are far more focused on insurance fundamentals (e.g. pricing and product development), representing the front-end of the value chain, whereas Solution Providers are focused on offering new services and channels, the back-end of the value chain. If both can be successful, their combined forces have the potential to transform the entire value chain — a partnership that will save insurers time in development, implementation and operation. InsurTech opinions are important as a signpost for what they are likely to prioritize and what may be coming. When we look at their focus points, their priorities, and their perceptions of customer pain points — we are likely to see some gaps between their views and the opinions of incumbent insurers. Our hypothesis was that there would be more gaps than similarities between Insurtechs and incumbents, i.e. InsurTechs would see many weaknesses they could exploit or improve; weaknesses that may be blind spots for incumbents, or “wicked problems” they know about but haven’t been able to solve. The significant business opportunity is in meeting unmet or underserved needs while making insurance better for customers. So, where do InsurTechs see the weaknesses (and thus, business opportunities) in the current customer journeys delivered by incumbent insurers? Across the board, Solution Providers believe incumbents’ processes are more difficult than Insurer/MGAs do (with one exception, researching policy offerings). (See Figure 3, below.) They see the greatest issues within claims, where filing a claim stands out. This view is reflected in Solution Providers’ value chain focus areas, where claims FNOL and Claims Settlement rank substantially higher. Solution Providers also ranked Quote/Buy much higher in their value chain focus (#5 vs. #11), and the “buy” part of this process is reflected in their feelings about the difficulty of completing a policy application with incumbents. Insurer/MGAs also think completing a policy application is one of the most difficult journey steps for incumbent insurers’ customers. 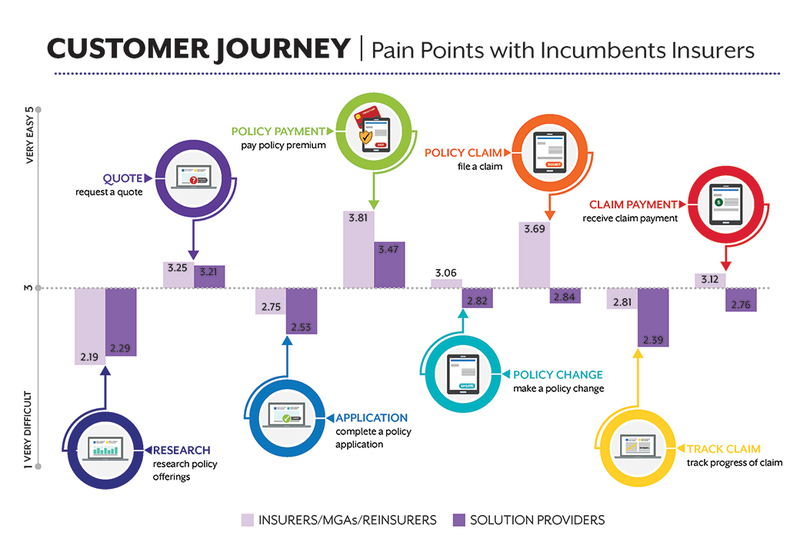 Both Insurer/MGAs and Solution Providers felt that their customers would rate completing a policy application as 1.4 times easier than incumbent insurers’ customers would (see Figure 4, below). In addition, both segments felt strongly about the ease their customers would have in researching policy offerings (1.3 times easier). Surprisingly, Insurer/MGAs’ ratings of the remaining pain points did not reflect much improvement over what they felt incumbents could deliver. However, those Solution Providers that addressed these pain points in their business models showed much more confidence in the superiority of their customer experience over what incumbents deliver. Given these potential clues into how they may try to exploit incumbent insurers’ vulnerabilities, we wondered how InsurTechs perceived the reception they are getting from incumbents. Solution Providers clearly feel they are viewed as allies of incumbents in the fight to improve current processes and customer experience (see Figure 5, below). 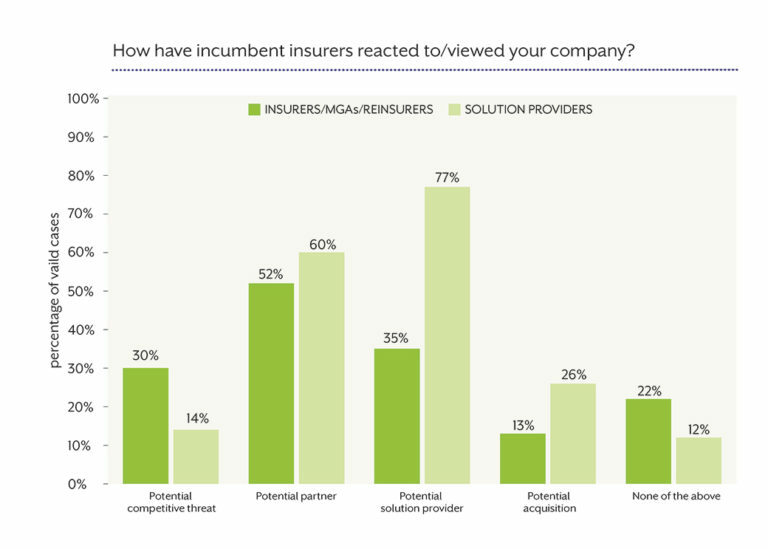 Interestingly, a substantial proportion of Insurer/MGAs hold the same view, feeling that their unique capabilities could be of benefit to incumbents. Slice, an MGA, is a great example. Slice sells on-demand insurance D2C, but also works with incumbent insurers to develop digital products on their platform that they sell to their customers. Insurer/MGAs can certainly enable incumbents to innovate through unique Insurer/MGA offerings, providing a path for incumbent growth and innovation. With their initial focus areas set and some experience under their belts, InsurTechs have a good sense of the internal and external challenges they face on the journey ahead. Both groups share nearly identical levels of concern over the internal issues of budget and digital capabilities, with the external issue of core system vendors’ ability to partner their other shared concern – an issue that has substantial consequences for incumbent insurers who are trying to embrace InsurTech solutions and bring Digital Insurance 2.0 products, processes and experiences to their customers before they drift away to those that are already supplying these. We anticipated this potential challenge as we began working in earnest with InsurTechs back in 2015. 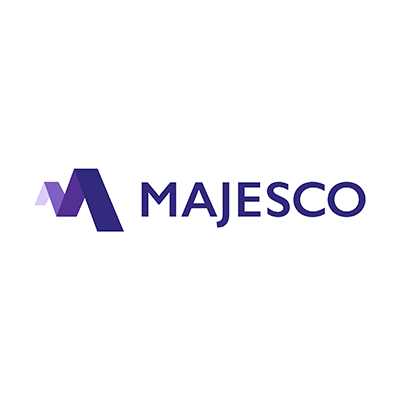 This led us to develop Majesco Digital1st Insurance™, designed and built as a microservices-based, multitenant cloud-native platform with the ability to subscribe to third-party services and real-time data sources that traditional core systems cannot effectively support. One of the components, a next generation partner ecosystem hub, offers an open set of curated third-party services with a standard semantic layer for easy integration and a true “plug-and-play” environment for both traditional and InsurTech partners. Together, they enable InsurTechs and innovative incumbents to transition to the digital, on-demand era allowing them to develop, test and launch the next era of new business models and innovative products, create rich customer experiences, and leverage a vast ecosystem of third-party capabilities to capture market opportunities and compete in the digital age. Incumbent insurers may still be scrambling, scrutinizing their options or slow to pick up on the value of InsurTech to their businesses. They aren’t, however, in paradigm limbo. Most insurers appear to have made the mental shift from InsurTech as competitive threat to InsurTech as a potential valued partner. Whether or not they have begun to seek these important partnerships and whether they can do so with their traditional core systems is a story that each insurer must tell on its own. But in Majesco’s recent thought-leadership report, InsurTech: Energizing the Shift to Digital Insurance 2.0, it is clear that the lines between insurers and InsurTech are beginning to fade to expose more examples of Digital Insurance 2.0 frameworks. However they choose to move, it is clear that insurance is headed in positive directions. Insurers and InsurTechs increasingly see the benefits of partnership for everyone involved. It’s about core competencies. It’s about providing excellent customer journeys. And it’s about time.